You said my house was very elven, yet I made no attempt to hide the modern conveniences. Just bring in what style you can and it will work. Okay. I will try to remember that! Since your laundry is tucked under your stairs, it's less of an issue, I guess. My laundry is a rather large space, which I would like to make more enjoyable. But you are right. I have to work around what is there, to some degree. Turning the lolly columns into trees is getting more interesting; because then, the clotheslines could go between the trees. Kind of funny. 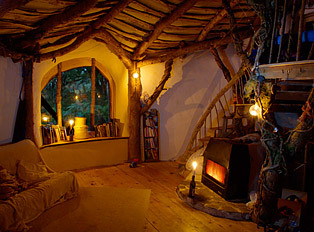 I think I want the woodstove area to be like a cave or maybe a foundry or maybe a sort of stone dell. I could transition from the laundry forest into the woodstove cave... The well equipment could either stay there, looking out of place, or I could put up a light cover (plywood) around them that is removable to get at the well equipment, and paint that too. That's not a bad idea, Beregond. I've done something similar to the beams in my ceiling. They would have been too difficult to refinish so we bought new wood and wraped it around them. It's much cheaper than real stone and concrete can be recycled. Check out vintaglog.com's section on fireplace mantels and chimneys for some really neat rehabbed stone products as well -- including an actual iron foundry! Last edited by Morthoron; 01-05-2009 at 12:01 PM. Trust me, this has to be low-budget! Stones will be painted, not pointed... I will only be able to do wood-over-lolly if I can find a way to do it very VERY cheaply. 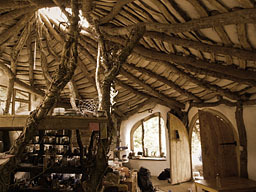 Otherwise I will choose between painting on grey bark or brown bark, and then figuring out how to smooth the shape into the ceiling beams (which will then become branches, I think/hope.). Since I love beech trees, and they are very smooth and slender, I may go with beech, hence grey, and that will thematically roll into grey stones rather nicely as well. Last edited by mark12_30; 01-05-2009 at 12:19 PM. Be ecologically responsible (in imitation of our elf friends!). You might like this website. I'm not sure about the structural integrity of the framework, but it's still quite informative. Yes, that site has been around for quite a while. It is indeed an amazing structure; unfortunately, being a curmudgeonly old Hobbit accustomed to modern conveniences, I would not have it as a primary residence. But it would make a great place for camping in the summer, as my back can no longer withstand hard ground and sleeping bags for more than a day or two. I'd construct such an edifice up on the shores of Lake Superior or Lake Michigan and hang out there until the autumn winds chased me back south. I can't tell you how inspiring that house is, Andsigil. To make such an uber cool abode, and to do it so cheaply ($6000 USD? You can't buy a new car for that). 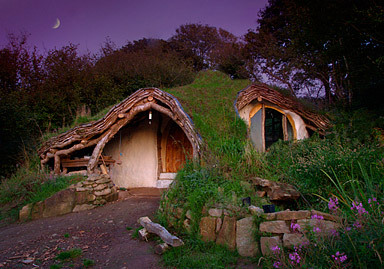 Doesn't it make you want to go out, buy a section of forest or meadow, and erect a Hobbit House? That type of structure is very cool and although it works in the UK, their downfall in the US is that they are NOT INSURABLE. In fact they probablly don't come close to meeting building code. Most wood framed buildings are unmortgageable in the UK - in fact pretty much the only homes you can easily get mortgages for are standard ones built with proper brick/stone on foundations (and you're lucky if you can get a mortgage on one of those these days ...). However since the building cost was so low ...mortgage /insurance isn't really an issue - planning is a minefield - a weighted towards the mass developer... I'd be suprised if this had planning permission. Has anyone done a tree stencil? I'm not afraid of drawing a large tree; what I am afraid of is running out of time while I work on the leaves. SO in my daydreams, I think I can paint the tree trunks freehand, and then stencil on the leaves, or stamp them, or a combination of the two. But then I think of the volume of trees I want to put on the wall, it gets daunting. So: painting the trunk, then stanciling or stamping the leaves... ? I actualy cleaned the room upstairs, and rearranged all the stuff that was everywhere. Lots of it went onto the walls. Now there isn't much room for more. Maybe I rearranged myself into a corner. I've both painted trees and used stencils. But stencils are so small they are good for little other than borders. We can easily paint a tree, mural-size, on the wall. If it doesn't look right, hey, it's just paint, go over it. Is it just me and my faulty glasses, or are there no doors to the bedrooms? You have to look at it in context, Beth. Roger Dean is best known as designing all the album covers for the band Yes in the 70's; therefore, like the covers and the music, the house is so ethereal that one merely floats into the room through one of those window-like apertures in the wall. Well, that's a better explanation than I came up with, thinking those rooms must have been designed for owners of lonely hearts, so they would never be used for any activity which is often indulged in privately, particularly when desirous of ensuring that children don't pop out of their safe nooks and go looking for strange noises. Yeah, I noticed that too. I'm not sure I could live without a door. Well, without doors it certainly would be a long distance runaround, or annoyingly roudabout, to say the least. And you and I would not be comfortable living there. Well, my room has a door, a rectangular one. Luckily it is made of nice wood. There's nice wood trim all through the upstairs. I've rearranged my room a bit, put some things on the walls that had been taking up surface space, and pulled out more dark green table coverings (old tablecloths-- I had a set of dark green grapevine tablecloths we haven't used in years, so I put them on the dressers), and moved out the rugs that clashed (burgundy imitation- oriental; OK, but clashing with green vines and leaves...) Yesterday I made two stencils, one large vine-tendril (to match the bedspread) and one smallish, bare tree stencil (maybe eight inches tall.) But I have yet to paint anything with them. So the bedroom has a light-green-and-gold vine theme contrasting with the dark green grapevine theme. But some of the rugs are sea green. It almost works but not quite... maybe I can pick up the right rugs over time. Now I'm trying to decide whether to put a ficus tree in the room. First I need to find the sheer curtain I took down and put away somewhere (I hope I didn't THROW it away) and paint some vines on that. I think I need to be realistic about the basement, at least for a while. A few simple touches will have to do... although I'd LOVE to turn it into a forest-with-foundry... not this year. I'm collecting stencils and stamps... vines and leaves, leaves and vines. If you can't take the elvish wannabe to the forest, why then take the forest to the elf-wannabe. Hmmm...perhaps around the door you can stencil the runes found on the Hollin Gate, overgrown with your vine and leaf stencils. That's a great Idea, Morthoron! It's gonna be awesome, Helen! We'll come up with an exciting plan. Morthoron, I love that idea. I could put up some runes of my own, and then tangle them. Now I shall have to think about what I would want to say over the door? I know people hjave translated various sections of scriptures and prayers into elvish-- I should look those up too. SOme of the quotes could be in english, just in a elvish "font"-- beefore I entangle them in the vines! I love that idea too! Pretty original, but very cool. If you need help with transliteration I'm sure we'd love to help - but you may know your elvish already! My living room now has three wintry trees painted on the walls-- two in the righthand corner, and one on the left by the door. Leaves are very sparse yet. The walls are painted in semi gloss so the stencil paint takes over two DAYS to dry...! Anyway it's progress. Covered our floor-lampstands with ivy, too. Now the lampshades look awkward. I've been daydreaming about my wall-scripture in an elvish font... Mark 12:30 is the likely winner, and it will probably go on a slanted ceiling/wall, and then get covered (or partly covered) with ivy stencil. I found an ivy stencil that is appropriately wispy and wandering, I think. How big are the trees? Like feet or inches? Rome wasn't built in a day, Helen. If you're looking for leaves, you could always sponge them on. There is a mural at my school that has a tree with sponged on leaves, and it looks really nice! umm, that's a little over the top for me. I think I'd rather have a simple platform. See now, with me, I'd be afraid of rolling off the platform. And I definitely lack Helen's skill with art, so bringing trees into my house that way wouldn't work. This is near a town where some of the family live, so the next time I'm out there, I might check it out. And if it's like living in a rubik's cube--er, sphere--I'll say you warned me. Yeah, I'd have to put a rail or ropes like a ship on the edge. Helen, You're doing so great I'm not sure why you think you need my help at all! Oh, trust me. I'll be much happier with your touches in place. Today I put (painted) the ground under the tree, so it doesn't float in thin air just above the radiator any more. The leaves take about three days to dry, but they do EVENTUALLY dry. Still pondering this one, Morthoron! I think it's going to be Mark12:30; not sure I will use silver (oh come on, how can I NOT use Ithildin??? but the walls are very light colored.) THen the vines, around and entwining. Light colored walls; Ithildin = silver colored. Pondering. Hmmmm. You, My dear Hobbit are an AWESOME artist!